My in-laws have a vacation home in the town of Tolland Ma, just west of Granville. 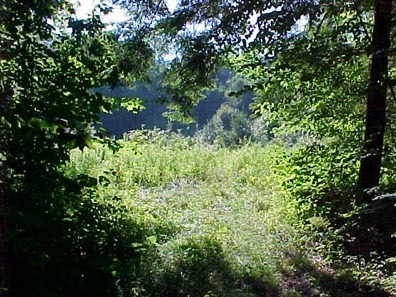 It is in a private lake community called Wildwood, which encompasses 700 acres, and 2 ponds. This was developed in 1966. 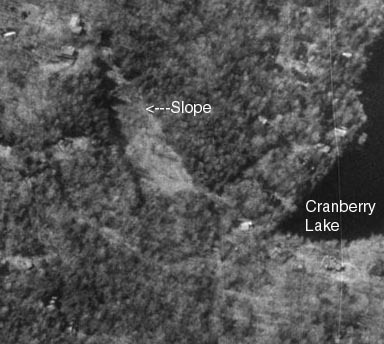 There is a slope with in there that was cleared, and used as a ski slope. It had 1 hill, a hut, and what looks like a rope tow, that was powered by a flathead 8cyl engine. Most of the remains have been cleared, and the slope is beginning to grow over now. Karl Ellison used to work here: I used to run the ski lift at Wildwood in the early 80's. Our family owns a cabin right near it (3 minute walk). It was shutdown because of insurance fees in the mid 80's, has rotted beyond belief, and was recently removed, warming hut skeleton still stands. Hill has reverted back to woods for the most part. Bill took some great photos of the area during the summer of 2002 to share with NELSAP. 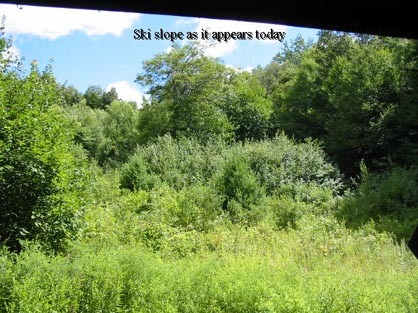 The ski slope as it appears today, quite grown in. 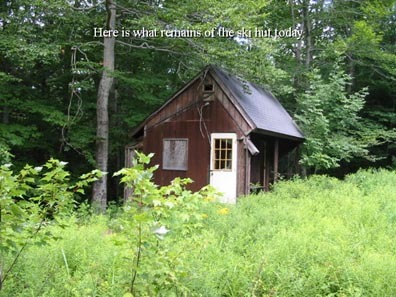 The remains of the ski hut. 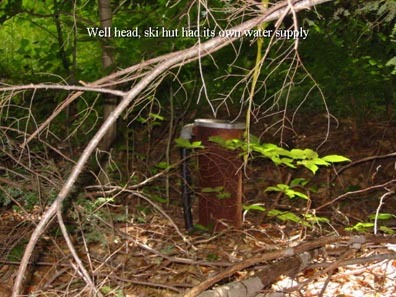 Well head, ski hut had its own water supply. 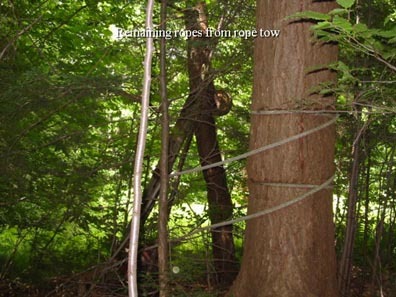 Remaining ropes from rope tow. 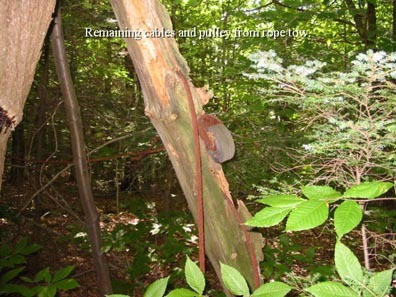 Remaining cables and pulley from rope tow. 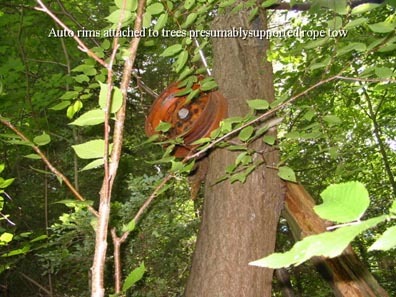 Auto rims attached to trees presumably supported rope tow. The motor-house was powered from a in-line 6-cyl Willys Jeep motor, started with a 6V car battery. The Transmission from the Jeep was used to power the pulley system. Low, medium, fast, too-fast were achievable. If the 'load' of people were too big, I'd have to shift down a gear and rev the engine a little more, just like a car climbing a hill. When there weren't too many people using the life at once, I'd put it into a higher gear and a lower engine speed to save gas. If little children were trying the first time, I'd slow the motor down for them. The exhaust always leaked, and so you didn't stay in there too long at any time. If skiers didn't let go at the top of the hill they'd pass the upper house towards the return pulley, but would run into a string that was tied across their path at one end to a tree and the other end to a household power plug that was shorted out and plugged into a household outlet mounted on the upper watch house - all of which was in series with the ignition wire of the motor. Tripping the string yanked out the attached plug from the outlet, breaking the ignition circuit and stopping the motor. Then you had to have someone (who was SUPPOSED to be up there monitoring - rarely did we do that in practice though - took away from skiing time!) put the plug back in and yell down the hill (or send the 'OK' message down with a skier). Simple and effective, and I'm certain was an OSHA/insurance no-no. if the string broke or a small child slipped under the plug while their scarf was caught, I don't want to think about what would have happened! This picture shows the hill from the base. This used to be cleared with the exception of 2-3 groups of tall trees. To the right was the motor-house and the rope tow. To the left is the warming hut, with full bathroom facilities and a wood stove and picnic tables. 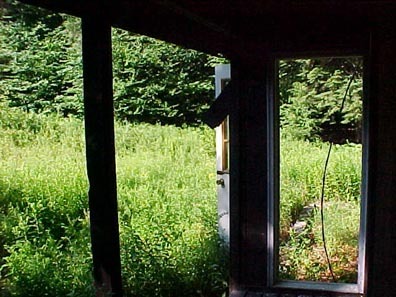 Picture 360 show a shot from in the razed warming hut's deck looking towards the right side of the mountain where you used to see the motor-house and rope/pulleys. You'd start the day running the decrepit SKI-DO up and down to break the crust and make it nice. On the way down you'd take the rope off the hooks that were attached to the trees that lined the path of the rope. At closing time, you'd send a kid up one last ride, and on the way down he'd hang the rope on the tree hooks to get it off the ground so it wouldn't freeze/rot. Then go home ... Wildwood is a private community of lakeside cottages, so this was only open to association members and their guests - nothing to lock up or worry about up there! With the memories I had here in the '70s, I'm very sad to see the place like this. It used to be bustling with families! The cost of insurance shut it down in the early 80's. It was set up around 1970.